"Everything about the event exceeded any expectations we might have had, there seemed to always be something going on, and the welcome pack still amazes me. To manage to produce something that well organized and yet still make it seem effortless and fun is and amazing feat." "We had an awful lot of fun on the convention. We hope we can make it next year again to Swindon." "Just wanted to write to say thank you for a brilliant weekend. I thought that all you fforganisers did a fantastic job and made the weekend enjoyable, fun and well just a little bizarre." 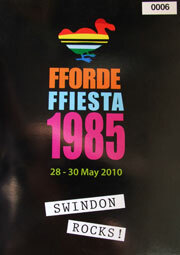 Fforde Ffiesta 1985 from martin gooch on Vimeo. March of the Mrs. Danvers. from martin gooch on Vimeo. Strontium Goat - Goliath from martin gooch on Vimeo.